Come out and see the Gini! Calling all Cali members (and those always up for a roadtrip) of the Alien Collective! The time to meet and mingle with Gini is upon us. I know, dramatic much?...whateva I has flair. October 1, 10 am to 4 pm - High Desert Book Fair - Gini will be signing in the Barnes and Noble adults area from 12-1pm (and possibly more!) and will also give a Main Tent presentation with Q&A at 1:30 pm. A Main Tent book signing follows directly after. Be sure to sign up for your FREE TICKETS to Main Tent presentations! Robots, Water and Death Kickstarter makes its initial production goal 60 hrs left to pledge! The Robots, Water and Death Anthologies meets its production goal! Don't miss out on this great Zombies Need Brains campaign and its opportunity to get two more stories from our author gal Gini. There's still an opportunity for Tuckerizations available for Gini's story in Submerged as well as some pretty sweet backer rewards. Take a look, pledge some dough help bring new stories to the world! You'll feel better, I promise. If you're a podcast listener/Gini-news follower, then you (should) know that Gini's been featured on Creative Play and Podcast Network before. As the road of fandom love is a two-way street, please consider supporting their fundraising efforts on Indiegogo. They're hoping to make Season 3 the best it can be. Ever wanted to name a role-playing game character or give voice to a a role? Interested in being a Show Sponsor or Producer? 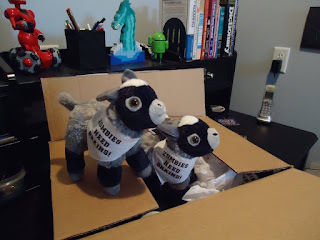 Just want a shout out and a thank you for a mini-interweb moment of awesome? Now's your chance to help keep the gaming and adventure going! Check out Gini's joint review with her Slice of SciFi/Pop Culture Geeks editor, Summer Brooks, of The Magnificent Seven and plan your own movie night. Stay tuned for more Gini-news! Hail and well met members of the Collective! You have some great opportunities to see the Gini, speak with the Gini, and buy new works by the Gini coming your way. See, I know what's important...it's the Giniverse and our sassy author friend in a signature pink cowgirl hat. Join Gini at the Barnes and Noble in Victorville Mall on Friday, September 30th, 3 pm to 7 pm. She'll be speaking and signing copies of the latest release from the Alien series: Camp Alien - as well as all of her other book-shaped offerings. If you can't make it to the mall - or you just feel the need to capitalize on all chances of a Gini sightings - you should stick around and head out to the inaugural High Desert Book Fair on Saturday, October 1, 10:00 am to 4:00 pm also in Victorville. Gini will be a Main Tent Speaker with Q&A at 1:30 pm, followed by a Main Tent book signing. Have no fear, Gini will be around all day signing and giving out hugs in grand Gini-style. And don't forget that Gini's ONLY East Coast appearances this year will be in Richmond, VA, at the James River Writers Conference, October 14-16, and at Fountain Bookstore, October 16. If you're even close to nearish to the area, don't miss out on your only chance to see our girl up close and in person! If you missed out on supporting this Kickstarter, here's your chance to nab these books. 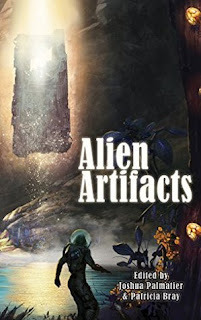 Alien Artifacts stories are about humanity discovering what aliens have left behind, and Were- is about were-creatures other than werewolves. If you've devoured these stories already please do our author a solid post a review on goodreads, Amazon, or Barnes and Noble. Gini's story in Artifacts is an Alien series short, "Alien Epilogue", that goes into what happened to the folks in Bizarro World after "the switch." Gini's story in Were- is her very first YA, "Missy the Were-Pomeranian vs. the Masters of Mediocre Doom". You know you want them, so get them, now! Spread the word; book-pushing is a kindness...really, friends don't let friends miss great stories. 10 days left to support Robots, Water and Death Anthologies! 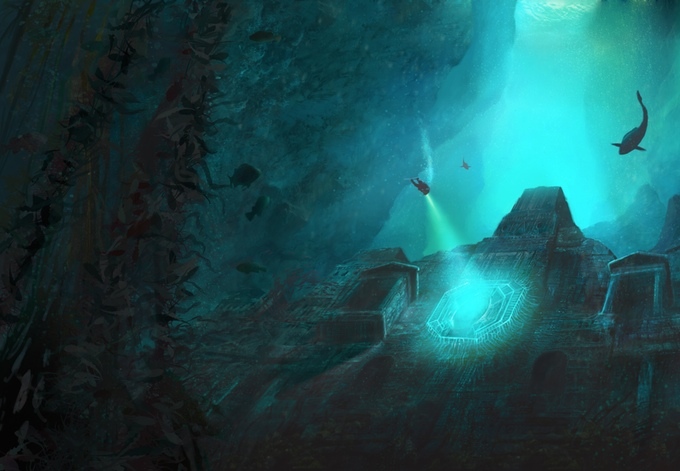 The latest Zombies Need Brains Kickstarter to fund 3 new science fiction fantasy anthologies: Submerged (stories set underwater), All Hail Our Robot Conquerors! (stories with robots harkening back to the 50's/60's), and The Death of All Things (stories with Death as a character) is $4197 away from its initial production goal. Don't miss out on the opportunity for a new J.C. Koch horror story in Submerged and a new short story set in the universe of the Alien series in All Hail Our Robot Conquerors! AND, don't miss out on a chance to be a character in one of Gini's stories -- there are still tuckerizations left for her story for Submerged, so check it out and get your name in lights. So to speak. Also don't forget to check out the different rewards for backing this project. There are zombie goats as a prize available people; ZOMBIE GOAT PLUSHIES. Gini's excited to write new stories for two of the anthologies and let's not forget it's another opportunity for you to have yourself written into the Giniverse. So stop on by check out the campaign and become a backer! If you're anything like me - god help you if so I'm a wee bit nutty - then you've tried to picture what characters from stories look like while you're reading. One of my favorite things to do is surf the interwebs for fan art. Ever wondered what the Peregrine species from the Alien series might look like? Well, talented artist and the Head of Team Gini Lisa Lingenfelter Dovichi has made her imaginings of Bruno the Peregrine available for purchase in her new Esty store PrintsCharmingbyLisa. 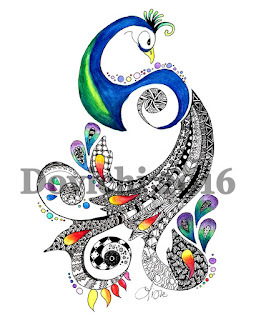 Check out Bruno and her other artwork - it's: "Where Watercolors and Zentangles Collide." Last but not least, remember that now's the time to be sure that you pre-order Alien Nation from your favorite bookstore or online retailer. More and more, pre-orders matter to publishers and, therefore, to authors and, by extension, readers. We want the Alien series to go on forever and ever, right? Then pre-orders are a must! So, do our girl a solid and get those pre-orders in pronto! Now, if anyone knows who's got the 2016 remote, let me know because I really should be the operator. Hope everyone has a lovely weekend planned, and a special whoo hoo to those who get a long Labor Day weekend -- enjoy and be good to each other out there, especially those working retail and such! Just a fast one to share that the cover for Alien Nation is up at the website. Head over to my Premieres page and let me know what you think of it! And remember to do your girl a solid and pre-order that puppy from your favorite brick and mortar or online bookstore!